The members of the Trump administration sure have a knack for giving on-the-record off-the-record interviews. First, former White House Communications Director Anthony Scaramucci stepped in it by ranting to The New Yorker's Ryan Lizza about his hostile relationship with Reince Priebus. Now, Chief Strategist Steve Bannon is in hot water for his own controversial conversation with a leftist publication. As Fox News notes, his conversation was "PG" by comparison to the Mooch's profane diatribe. But that doesn't mean it was any less controversial. 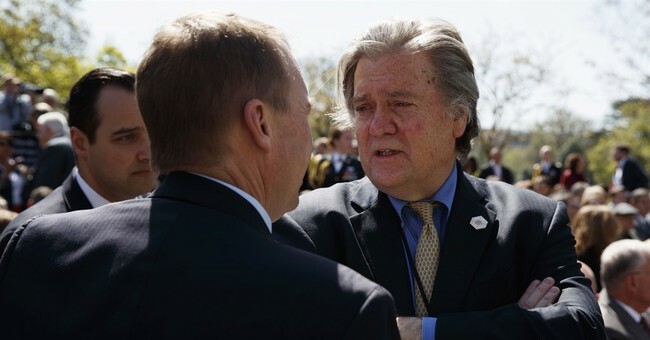 Bannon gifted time to reporter Robert Kuttner, who works for the liberal outlet The American Prospect, because, the chief strategist explained, he appreciated a piece Kuttner wrote about how China would benefit from the nuclear tete-a-tete between the U.S. and North Korea. When he called Kuttner, Bannon proceeded to dish on his White House opponents, and even contradicted the president's foreign policy rhetoric. For instance, he weighed in on the need to enforce more sanctions against China, and said that he is ready to show the door to any one who disagrees with him. "I’m changing out people at East Asian Defense; I’m getting hawks in. I’m getting Susan Thornton [acting head of East Asian and Pacific Affairs] out at State," he said. Bannon then appeared to question President Trump's aggressive "fire and fury" attitude toward North Korea. "There's no military solution [to North Korea's nuclear threats], forget it," the chief strategist revealed. Bannon also weighed in on the white supremacists who organized the deadly rally in Charlottesville, VA, appearing to take a harder, and more direct stance than Trump. “These guys are a collection of clowns,” he said, in part, adding that they "gotta help crush it." Trump supporters like Newt Gingrich openly criticized Bannon for awarding the interview, telling "Fox and Friends" that it would have been more appropriate for the chief strategist to make his argument in the Oval Office. "Frankly, I don’t know what Bannon thinks he was accomplishing,” Gingrich said. He may not have used as many expletives in his American Prospect interview, but will Bannon be shown the exit for exposing the palace intrigue in the White House just as Scaramucci did after his "off the record" interview?